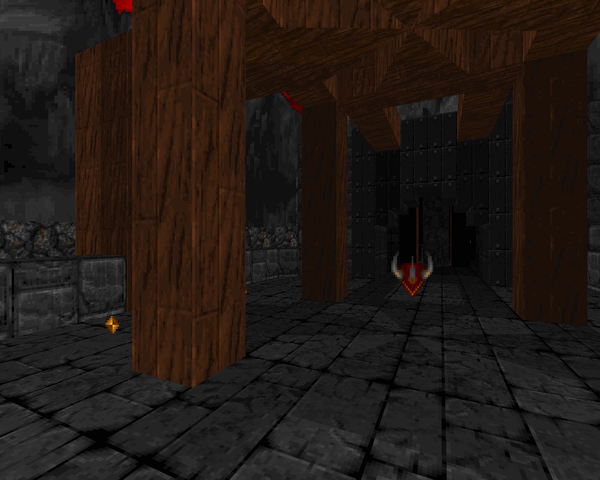 Torture is a pretty neat map, but it's got one big flaw; Lutz forgot to put an ethereal crossbow (or even gauntlets) in the level, an absence made all the more conspicuous by the overwhelming presence of ethereal arrows, useless unless you're fielding a carryover from the original E2M1 / E2M2. It's not impossible without the crossbow, but it's significantly harder, requiring clever item usage and skipping most of the enemy turrets. Do yourself a favor and just give yourself a crossbow; the map is much more enjoyable with it. Regardless, monsters come fast and furious, starting off with the obligatory gargoyle swarm to open and weredragons showing up in the first major room. Between the weres and the nitrogolems, it's a very tricky brawl given the damage floor and tactical hourglass usage. The northwestern area is similarly full of beasties you'll have to dance around, mixing it up with ghosts and undead warriors here and there. The finale is probably the nastiest moment, teleporting in some ground troops along with the standard wave of disciples, great at soaking up damage and just gumming the tiny maneuvering area up in general. It's a great time to save the ring for. 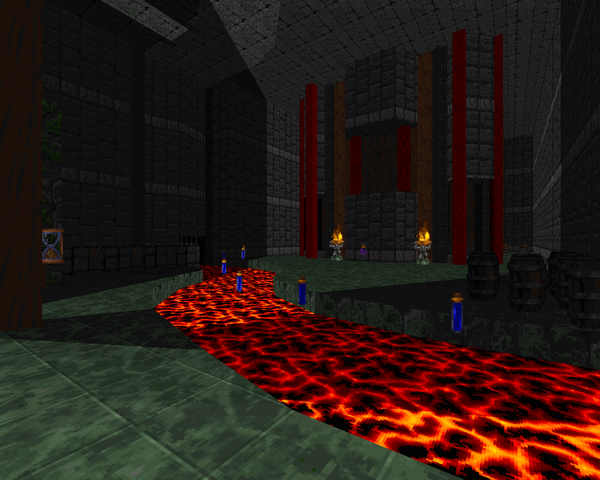 Once again, Lutz does a good job of cramming a nice looking level into a square-shaped box, with some surprising fidelity to the environment, like the lava fall that enters in from the north and wrecks much of the painstakingly-rendered masonry. Really, the whole opening sequence from the descent to the bridge to the first large room is a great intro to Lutz's fantasy world. 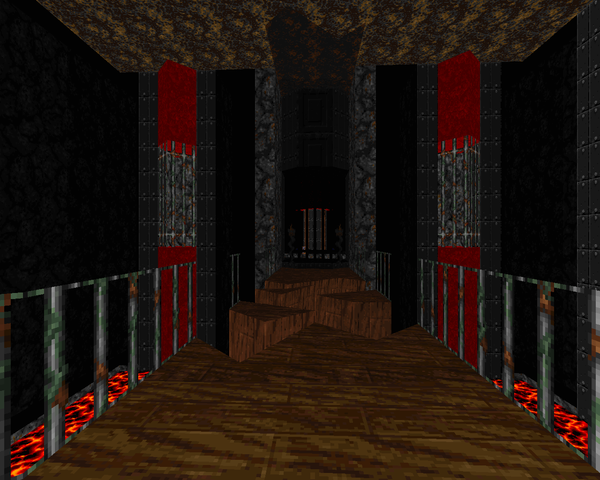 Some of the area borders, like the southwest room, are a little rectangular, but there are enough nice details stuck in there that you hardly notice, even more so when you're dodging fire. I also like the western side's blue key puzzle, which gives it a bit of an adventure game feel a la Hexen without overstepping Heretic's bounds. 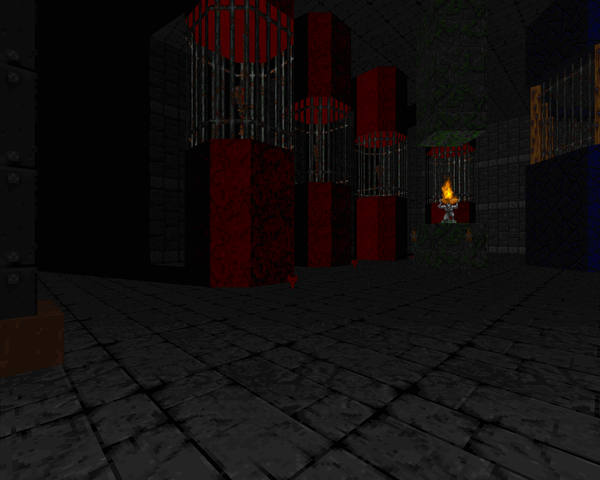 Torture is a really fun Heretic level as long as you remember to bring a crossbow. If you don't, it's still a good play, just really challenging in terms of sheer survival. 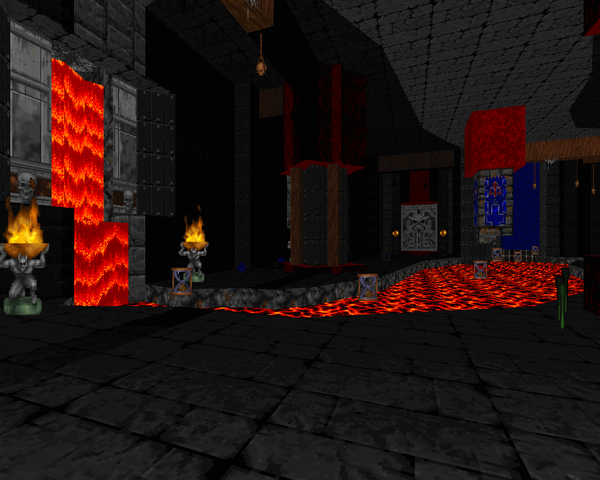 I'm not as fond of it as Lutz's Icebound or even his still earlier Reclamation, but if you're into Heretic at all, you need to play this level. Just type "summon crossbow" at the console or something.